These lyrics, sung long ago by Johnny Horton, tell of the final battle of the War of 1812 where Americans defeated a British invasion force. The song was a big hit when I was a kid and every time I head to Quebec’s Ile d’Orleans that song rattles around in my brain. Truth is, the French had their own battle against a British invasion and Wolfe, the leader of that invasion force, nearly died when his ship ran aground just off the coast of the island, and within cannon distance of the French forces. But war is not the topic of today’s post. 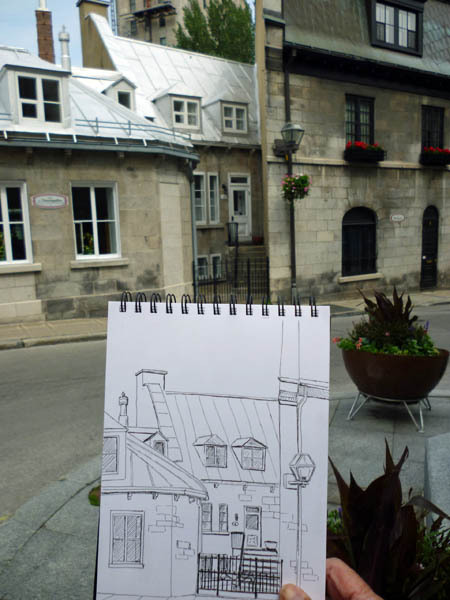 Rather, it is about a trip I took recently to Ile d’Orleans to sketch. I use ‘trip’ loosely as it takes all of fifteen minutes to get there as you can see Ile d’Orleans from Quebec City and vice versa. Going to the mall takes longer. Ile d’Orleans is a big island in the St. Lawrence River, just as it widens from its narrowest point, at Quebec City, on its way to the Atlantic Ocean. There are six municipalities on the island, though I have a hard time determining where one begins and another ends. What I know is that the island is gorgeous and I love my time there. A lot of vegetable and fruit growing goes on, and it’s a very popular tourist location. 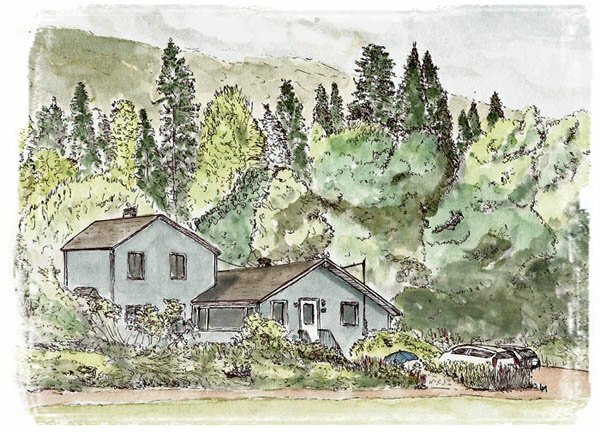 I’ve sketched on the island but I’ve never gone there alone, with the singular goal of sketching. This day, I was on a mission. The sun was out, I had sketchbooks a plenty, and I’d arranged to have our car for the day. I arrived on the island about 8:45 and drove to the backside of the island to a pier that juts out into the St. Lawrence. I discovered it when I was with my buddy Nicolas and we were like a couple kids, chasing the Queen Elizabeth II as she passed along the southern coast of the island on her approach to Quebec City. I walked out onto the pier, set up my stool and began sketching. You know what? Sun doesn’t help much when there’s a 20-30km/h wind blowing across a large body of water and its hyper-cooled air is cutting you in half. I was COLD!!! At one point I went back and sat in the car for a while to warm up but, finally I finished the sketch. I was a bit too much in a hurry, do you blame me, and ended up with some paint blooms in the foliage because my previous wash wasn’t yet dry, but them’s the breaks. I was really cold when I finished and so headed for a place I knew that serves wonderful brioche and good, hot coffee. Unfortunately, the winds had blown out their electricity – no coffee. So, I bought a brioche and sat in the car, with the heater running, to warm up. Across the street from the café is a church and a cemetery. 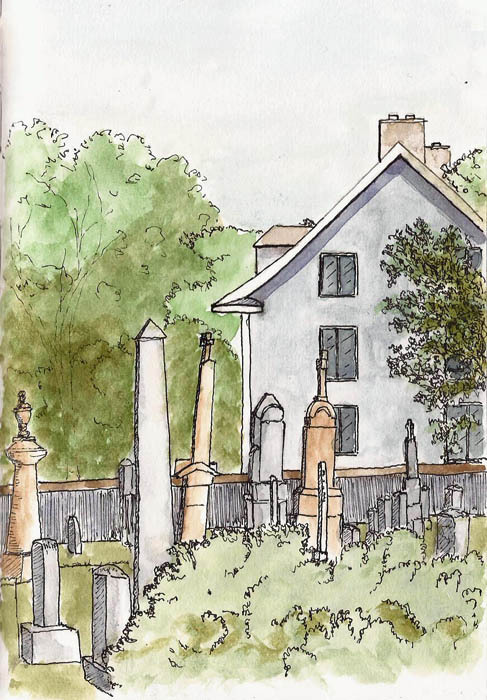 I keep telling myself that I should draw more in cemeteries as I love the shapes of the grave stones and their helter-skelter orientations, probably caused by the annual freezing and thawing of the ground. I found a view I liked, went back to the car to get my stuff and I was soon sitting in the cemetery sketching. This was a little better as there was a stone wall around the area that broke some of the wind. I was only semi-frozen when I finished this one. I was getting ready to leave. Actually I was turning around in the church parking lot when my eye caught a “Privé” sign and a lamp post. I love to have such things in my sketches and so I decided to sketch this scene. Once again, however, I would be fully-exposed to that darn wind coming off the St. Lawrence. I am old but even I can learn new tricks. I positioned the car so I could sketch while sitting inside. About halfway through I was wishing I had a hacksaw to eliminate the steering wheel but it worked out ok once I got the hang of it. This Is The Back Of The Building? I was downtown Sunday, waiting for the Festivale de Nouvelle France events to spool up. I was sitting in the courtyard in front of the Trinity Anglican Church and from there I could see this view of the back of large government building. I think it’s the finance building. I decided to sketch it. I took a somewhat different approach, experimenting a bit. I spent more time with a pencil, adding more than just layout lines. I used my typical 3H pencil, but from these light lines, I laid in light color washes before I added any ink to the sketch. This allowed me, or so I think, to use a lighter hand with the ink lines, which I followed up with more watercolor. I think, if I knew anything about watercolors, this would be a good approach. I know it works well for many other sketchers and I’ll continue to pursue it. I did it in my Stillman & Birn Zeta (5×8) sketchbook, with a Pilot Prera and Noodler’s Lexington Gray ink. I don’t have an official count but I think Quebec City has more restaurants per capita than most cities on the planet. I pass no less than 9 of them on my way to a new one that has just opened and I don’t live in what one might call a dining hotspot. 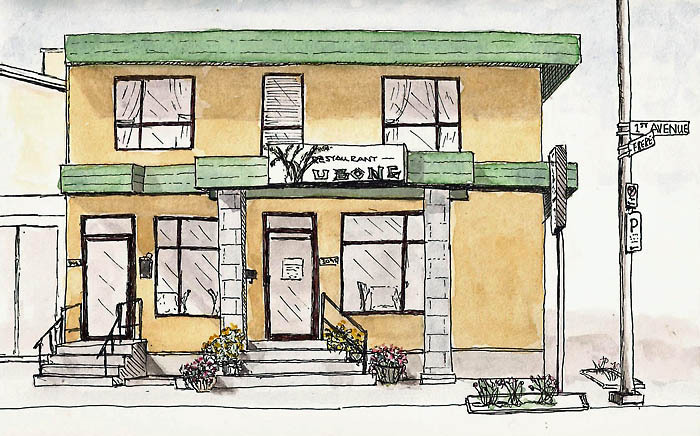 But open it has, a new Vietnamese restaurant named Ubong. If the outside is any reflection of the inside, though, I’m sure it will be successful as they’ve completely remodeled the building and painted it with this stunning yellow and green paint and trim. It’s on a well-traveled street and every once in a while I’d have to stop as a truck or bus blocked my view and there was a steady stream of pedestrians, some of whom stopped to say hello. I really enjoy this part of street sketching. It was sketched in my Stillman & Birn Zeta (5×8) and I used a Uniball Signo UM-151 (.38) in black, followed by drawing the window and door frames using a brown-black version of the same pen. W&N artist watercolors added a bit of shadow and color. 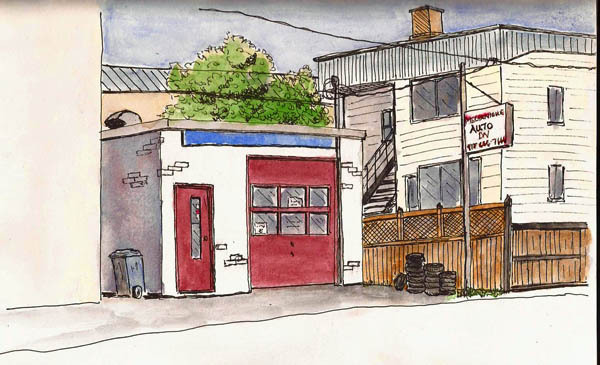 I’m a sketcher… a street sketcher. What excites me about sketching is the process, not the results. I love the feeling I have as I sit, studying a subject, drawing lines – oblivious to everything around me. I love people who stop and ask questions. Often they’re the same questions (eg – Do you sell these? Did you go to art school? How long have you been doing this?) but there’s always a smile attached and some simple chit-chat that connects me to my fellow humans. And part of the process, for me, is finding something to sketch… the thrill of the hunt. It’s pretty rare that I plan to go some particular place to sketch some particular thing. That takes half the fun out of it for me. I like to just strike out, in any direction, looking for something that catches my attention. The other day I did just that. I walked to a main intersection near my house. There were metro buses that head east/west/north/south and I decided to hop the first one that came along. I found myself heading east and, once I had passed areas I knew well, I got off the bus. I continued, walking east until I came across a small park. I walked into it and sat on a bench. I looked around. There were ravens in one end of the park and I thought about sketching them. There were swings, slides, and what looked like a hamburger that kids could ride. It sat on a large spring. These would make a nice sketch, too. 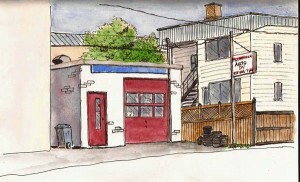 Then I noticed a small mechanics shop stuffed between two larger buildings. I walked to that corner of the park, picked out a shady area, plunked myself down on my tripod stool, and started this sketch. My hunt was a success. I spent a blissful hour while my pen entertained me as no television ever could. Life is good. Quebec City is not an industrial town. We have no massive factories except for our paper mill. Rather, we have government…lots of government as we’re the capital of the province of Quebec. And we have the oldest walled city in North America and cruise ships visit us regularly. We do tourism. And so we have lots of politicians and tourists. We also have UbiSoft, the video game manufacturer so we have animators…story-tellers. In short, no big factories to sketch. 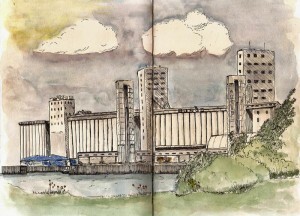 I took it as something of a challenge and so became my sketch of the Bunge grain elevators. Done in a Stillman & Birn Zeta (5×8 x 2) sketchbook with a Pilot Prera and Platinum Carbon Black ink. W&N watercolors give it a bit of color. Click for a larger image. While Walking Through The Park One Day…. 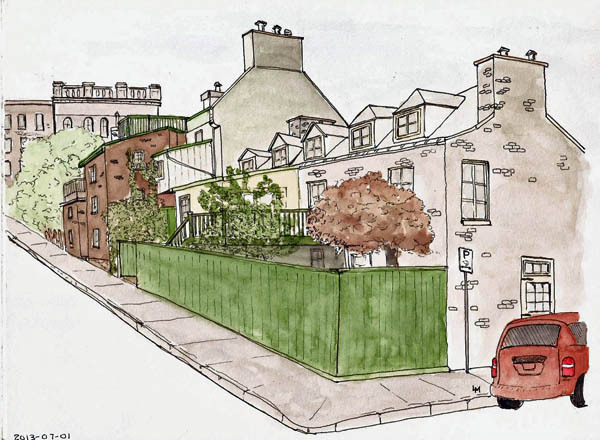 Yvan and I planned a sketching session on St. Denis street and we were to meet there. 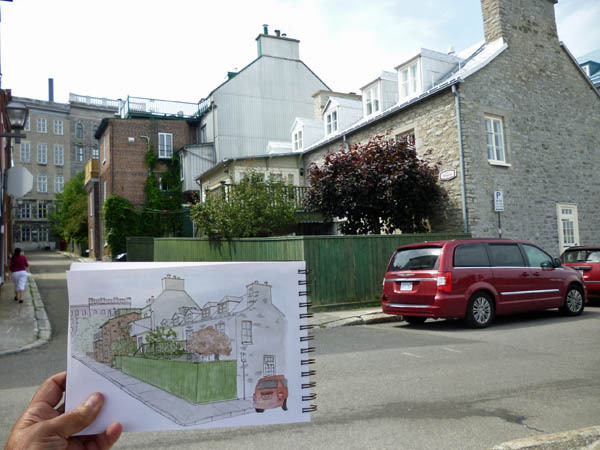 This street has many majestic residences and a large grassy area in front of them so it’s an ideal place to sketch. As I arrived I realized that I’d forgotten my WalkStool. This is a big problem as my knees and me don’t much like sitting on the ground, for fear that we’ll never be able to get back up. And so the search began for a sitting place with something in front of me to sketch. It’s not really rocket science but I wandered around for a while before finding such a combination. 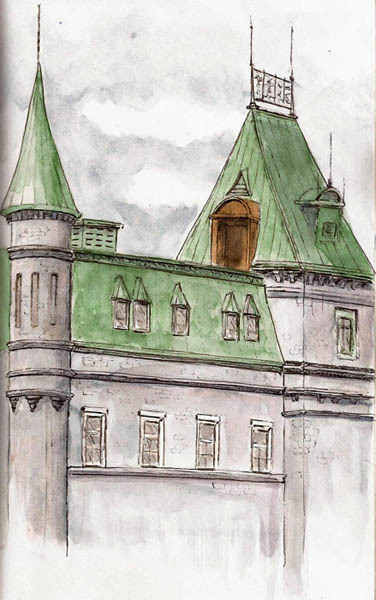 I ended up in the Parc des Governeurs, a small park between the Chateau Frontenac, Quebec City’s tourist landmark and the American consulate. 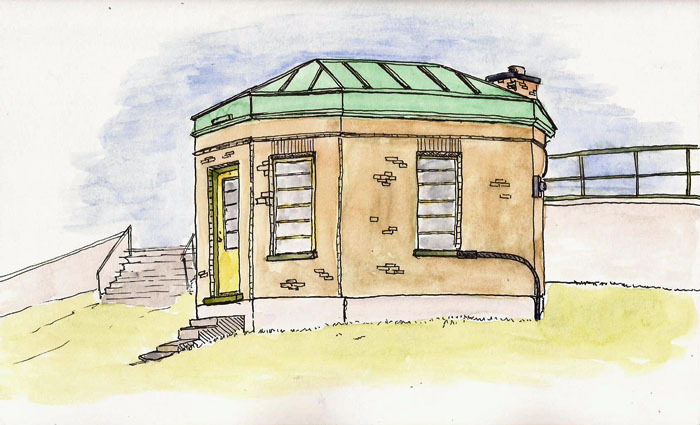 Both of these buildings are great sketching subjects but I chose this more humble structure that sits in the park. Yvan suggested that it was once a toilet but these days it looks to be used by maintenance people. In any case, it had a bench, in the shade, and so I sketched it in my Stillman & Birn Zeta (5×8) with a Pilot Prera and Platinum Carbon Black ink. I used Lexington Gray for the stairs in the background. I’m enjoying the contrast between these two inks. As always, I used Winsor & Newton watercolors like crayons to add some color. 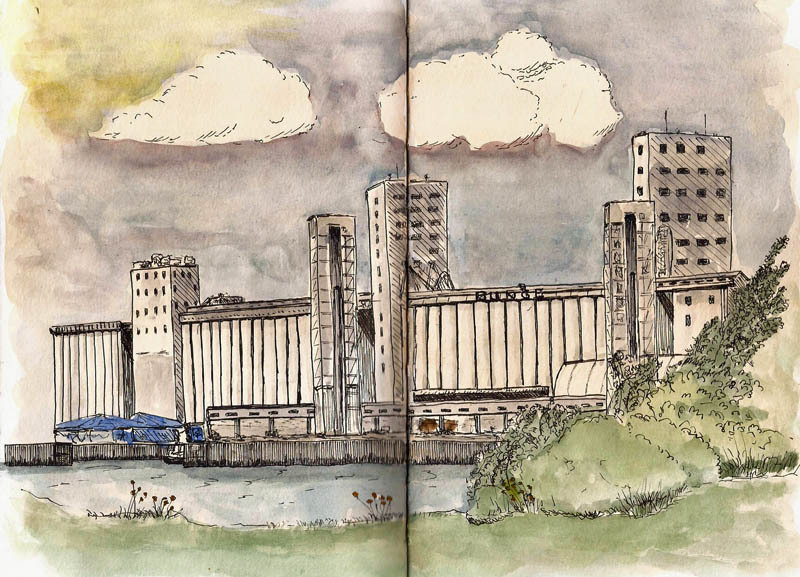 As an urban sketcher, with a penchant for the mundane, I couldn’t pass up this scene. The railroad track in the background feeds into the train station here in Quebec City. A passenger train was headed inbound. The track in the foreground is a seldom-used track that allows a connection between a huge cargo facility on one side of a river and another one on the other side. Not much traffic but they’re not interested in any at all when the passenger trains come and go (only a few times a day). 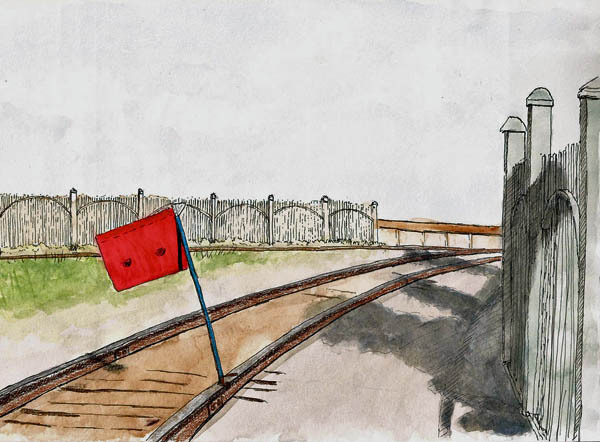 And so, they clip this flag to the track, to let anyone thinking of taking their train engine for a spin, not to do it. The bright red flag created an interesting scene, at least to me. Done in my Stillman & Birn Alpha (10×7) with a Pilot Prera, PCB ink, W&N artist watercolors and limited skill. I had a wonderful time last Saturday. I was invited to the house of long-time friend, Pierre Therrien, along with two other sketching buddies, one of them being Pierre’s constant companion and main squeeze, Celine. I picked Yvan up and we headed to Pierre’s house, which is just south of the North Pole, I think. We drove and drove and drove. Pierre lives in a forest. 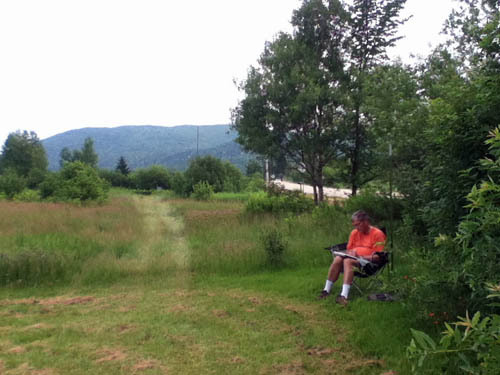 His home looks out on gorgeous forested landscape areas and is near Jacques Cartier River, a very sketch-ogenic river. It is a sketcher’s dream. We spent the first hour chatting about everything and anything and spent some time drooling over his art library. Then we decided that maybe sketching time was wasting away so we headed outside and broke out the pointy devices. 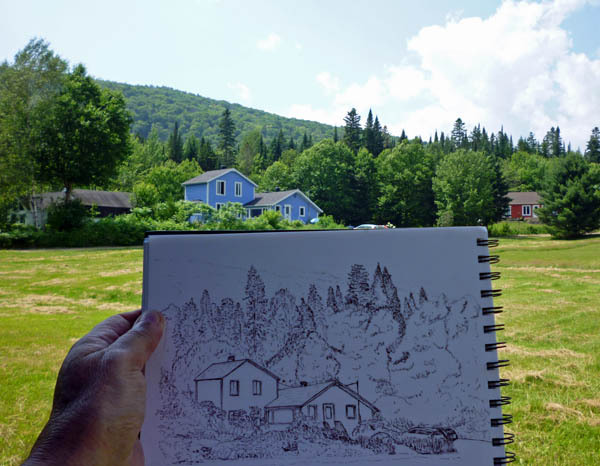 Yvan, Celine and Pierre set up in front of the house to draw the ‘paysage’ that splays out in front of it and ends with a backdrop of the Laurentian mountains which, to a Rocky Mountain guy like myself, have always more resembled hills than mountains. Everything’s relative, I guess, and so are mountains. But I’m an urban sketcher so I started wandering around. I found myself in a far corner of a field, looking back at Pierre’s house. Photo is courtesy of Yvan. You can see that I was very comfy as I had a full chair rather than my stool. All alone was I, except for the curious ants, too many biting flies and a Theridid spider. I tried to strike up a conversation with the spider but she didn’t say much. She just glared at me for plunking my chair down so close to her web. 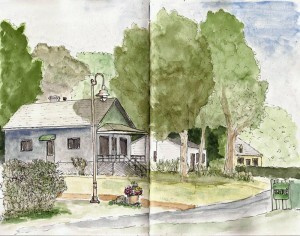 It’s fun to be out sketching early in the morning. Quebec City wakes up slowly and if you are out walking at 7AM, you’re mostly alone. 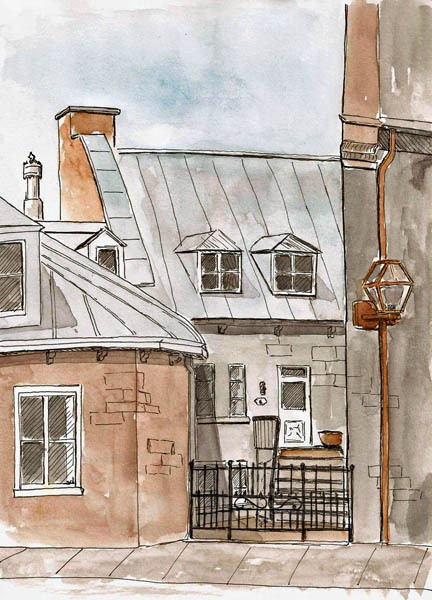 Of course this morning I met up with my buddy Yvan and we found ourselves on Rue des Remparts, a great sketching street that skirts the upper portion of the old city. We chose a scene, that was really the backyard and garage areas of several houses. The location also provided a nice shade tree under which I could sit. The sketch was done in a Stillman & Birn Alpha (10×7) sketchbooks using a Pilot Prera and Platinum Carbon Black. W&N artist watercolors and a a waterbrush were used to add color. Before it was done I was wishing I’d brought my real brushes along. The Ursuline Convent in Quebec City was founded in 1639, which makes it the earliest learning institution for woman in North America. It’s also seems that they owned half the old city at one point. Ok…maybe that’s an exaggeration but they owned a lot of land and buildings and still do. But most of the private residences and some of the other large buildings have been sold off. The curent compound is home to the convent, a school, and it’s a popular tourist stop. One of the private residences still held by the Ursulines is this place. I’m not sure how big it is but it’s got to have the smallest entrances of any on Quebec. Its unique nature made it a great sketching subject, though gray on gray isn’t the ideal color scheme, I suppose. The building on the left if the Ursuline library and museum. If you get to Quebec City, be sure to visit, if only to talk to the very nice people who work there. After we were done sketching, they let us browse through their library where we found several books used to teach drawing to students. While I’ve yet to tour the museum, they told me that there is a section on how drawing was taught to students. I’ve got to get back there to see that. I did the sketch in a Stillman & Birn Alpha (10×7) sketchbook using a TWSBI Mini with Platinum Carbon Black ink. I added some color… well, gray… with W&N artist watercolors.